Aria: Ich habe Gott, was fehlt mir noch? Johann Kuhnau owes his fame today mainly to the fact that he was Bach's predecessor as cantor at St. Thomas's in Leipzig. The 17th and 18th centuries meet in Kuhnau's cantatas, where a heavily text-bound musical language following on from the Schutz tradition is combined with Italian melodies and a late-baroque spaciousness – a combination especially delightful to today's ears. 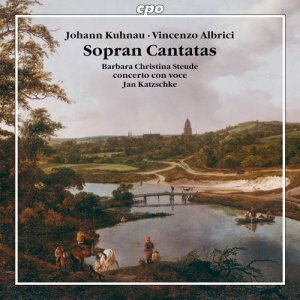 Rounding off the CD are cantatas by Kuhnau’s close friend Vincenzo Albrici.